Athletes aren’t the only ones who struggle with knee issues. According to a recent National Health Interview Survey, 30% of the adult population in the United States is currently suffering from some kind of knee pain. Thankfully, there are many different products available to people suffering from joint problems. But it can be hard to know which product to buy. There are almost as many types of knee braces as there are knee conditions. If you know you need a knee support but you don’t which kind to buy, read this guide. By the end of it, you’ll be ready to make a smart decision when it’s time to make your purchase. Knee Braces vs. Knee Sleeves: What’s the Difference? Generally speaking, knee braces are for injury recovery. Knee sleeves are for injury prevention. Knee braces offer the best knee support, but they are also rigid and restrictive. Knee sleeves are flexible, but they don’t provide much in the way of reinforcement. Many athletes believe that knee sleeves help them play harder and faster. Knee sleeves compress the knee, keeping it warm and limber. Compression is good for preventing swelling during and after intense exercises. Some people with special medical conditions like arthritis wear knee sleeves to reduce pain. Neoprene. Neoprene is a synthetic rubber. The best thing about neoprene is that it keeps its shape and won’t easily stretch out. On the other hand, some people think that neoprene smells bad. Neoprene braces are good for support, but if you’ve recently had major knee surgery or if you’re recovering from a serious injury, you’ll need something a little sturdier. Copper. 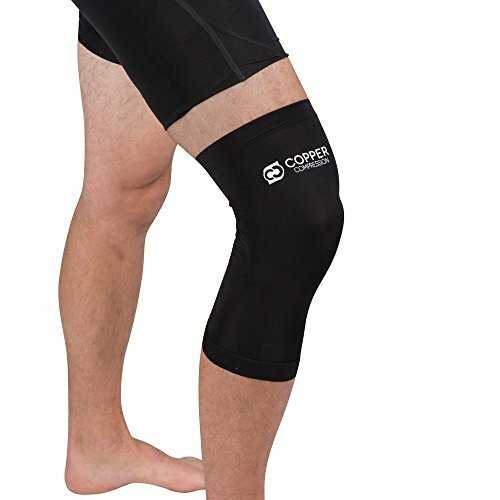 Copper lined knee support braces and sleeves are thought to enhance circulation, prevent injury and help reduce recovery time after an injury. 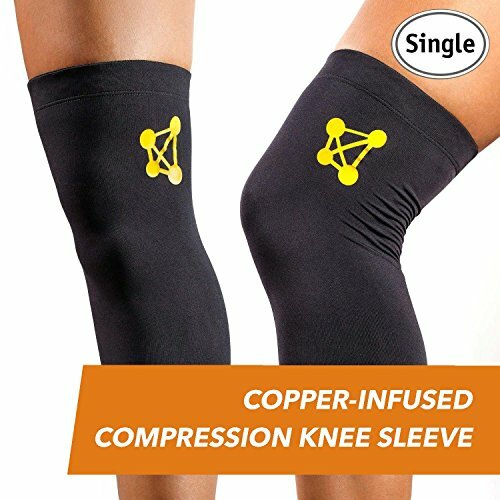 The only problem is that there currently isn’t much scientific evidence to support the health benefits of copper knee braces. Also, copper braces are pricey compared to other types of braces. Fabric. People who don’t like neoprene braces use fabric braces. Fabric braces don’t smell and they’re usually more comfortable compared to neoprene braces. On the other hand, fabric braces tend to stretch out over time and move around on your leg when you walk. Velcro. Most knee braces (and some knee sleeves) have velcro straps. Velcro is easy to adjust, plus it stays in place when you move. One downside to velcro, though, is that it tends to wear out rather quickly. Strapless knee braces and knee sleeves that come in different sizes tend to last longer. If you intend to buy a strapless brace or sleeve, it’s a good idea to try it on first before you buy. If your knee support doesn’t fit, it won’t do you any good. Injury Type. If you have a minor injury, all you’ll need is a knee strap or a knee sleeve.If your injury is serious, though, you’ll need to get something a little more heavy duty.Consult with your doctor before you make a final decision. Support vs. Flexibility. Before you buy, you’ll need to estimate how much moving around you’ll be doing while wearing knee support.Generally speaking, the sturdier a knee brace is the less flexibility you’ll get with it. Sizing. If you wear a brace that’s too small, you’ll risk making your injury worse.On the other hand, if your brace is too loose it won’t help you at all.If trying your brace on first before you buy isn’t an option, be sure to purchase a brace that comes with an 100% satisfaction guarantee. If a knee strap or a knee sleeve is what you’re after, start with the two products listed below. Both the CopperJoint Knee Sleeve and the Mueller Knee Strap are well-made and comfortable. They’re also both very reasonably priced. Not every knee problem requires a full sized knee brace. Sometimes, you can get away with using a knee sleeve instead. CopperJoint’s lightweight nylon knee sleeve has an anti-slip system, plus it’s comfortable and retains its elasticity well. The anti-slip feature. 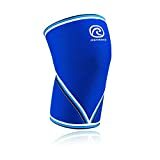 Inside this knee sleeve, there’s a reinforced silicon anti-slip “wave.” The wave keeps the knee slip firmly in place without causing discomfort. It doesn’t get stinky. This sleeve breathes well and wicks away moisture when you sweat. It’s comfortable. Unlike many knee sleeves, this one doesn’t get itchy. It doesn’t stretch out easily. The nylon fabric is strong, yet lightweight. It adapts to the shape of your leg. If you want to try out a knee sleeve, CopperJoint’s is the one to buy. It’s very reasonably priced, plus it has a handful of features that makes it better than the rest. Another reason why we recommend this brace is the fact that CopperJoint offers a 100% satisfaction guarantee. If for any reason this knee sleeve doesn’t meet your needs, you can return it for a full refund. If you have issues with your kneecap (chondromalacia, for example) you’ll need a patellar strap to give your kneecap extra support. 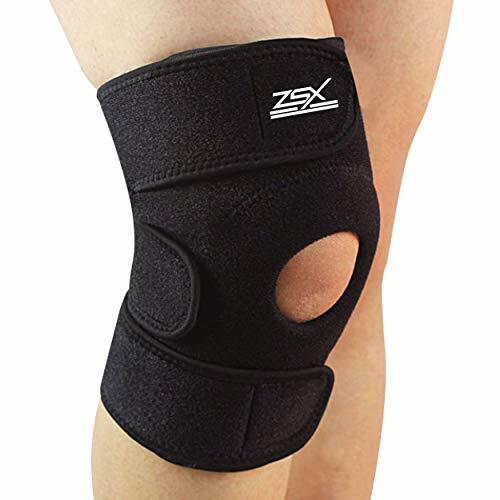 Knee straps are also good for conditions like patellar tendonitis and Osgood-Schlatter’s Disease. The Jumper’s Knee Strap by Mueller is inexpensive and very effective. Let’s take a closer look. Low profile. This strap isn’t bulky. You can wear it underneath your pants and nobody will notice. Adjustable velcro. This knee strap will never feel too tight, because you can adjust the tension to your liking. It’s safe to wash. This strap is well-made and won’t fall apart in the wash. Inexpensive. This strap is simple and inexpensive, yet surprisingly effective. 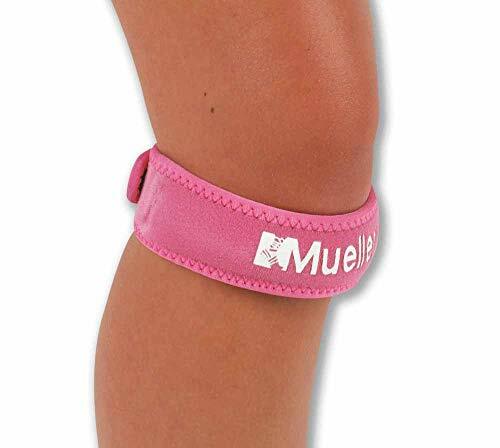 If your doctor says you need a knee strap, check out the Jumper’s Knee Strap by Mueller. The most attractive thing about this strap is that you can adjust the tension. Other elastic straps can’t be adjusted. Knee problems are especially troublesome for athletes. A knee injury can take a player out of the game– or even end a career. That’s why if you play sports, investing in knee protection is a smart thing to do. Adjustable velcro. This knee strap is fully adjustable and fits all knee sizes. Moisture vents. The moisture vents allow your knee to breathe and prevent the strap from getting sweaty. Lightweight and comfortable. This low-profile strap is thin enough to fit under your pants. A simple knee strap can make a world of difference. This one isn’t expensive at all, plus it comes in several different stylish colors. 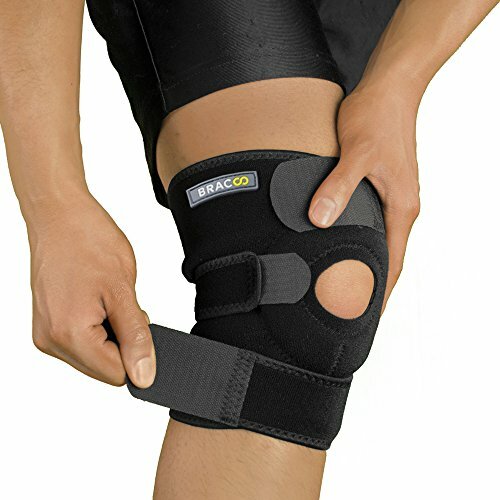 If you’re suffering from kneecap related issues, the Bracoo Knee Support Strap is definitely worth a try. 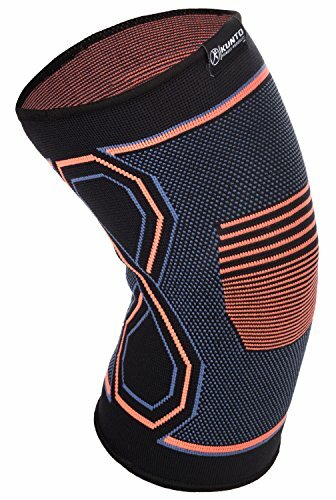 This stiff knee sleeve isn’t so great for running, but it’s perfect for weight training. The added stiffness adds extra knee support. When lifting very heavy weights, your knees need all the support they can get. Good support. This knee sleeve is the thickest, stiffest one on the market. Approved for use in professional sports competitions. Both the International Powerlifting Federation and the International Weightlifting Federation have approved this knee sleeve. Anatomical shape. This sleeve is designed to reinforce the natural curve of your knee joint. Designed specifically for weightlifters. Unlike flexible knee sleeves made for runners, this heavy duty knee band from Rehband is specifically made for powerlifters. 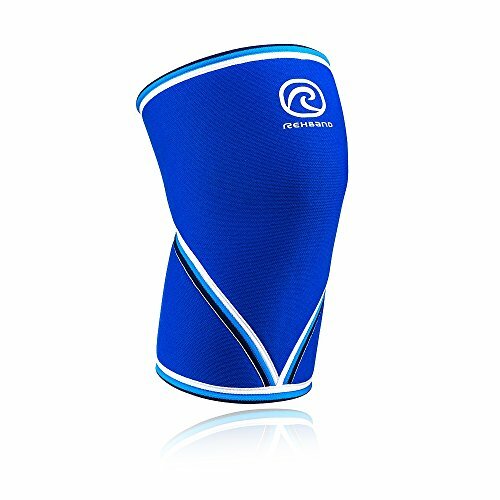 This is the perfect knee sleeve for weightlifters. It’s simple, yet rigid and effective. Just make sure you get the right size, because this knee sleeve is not adjustable. If you develop a knee issue, you won’t be able to jump. And if you can’t jump, you can’t play basketball. The 6446 Leg Sleeve by McDavid is designed to protect and reinforce your knees while you’re on the court. Patented Hex Technology. The flexible, hexagon patterned pads protect your knees from impact. Protection and support. This full-length knee support accessory protects and supports your legs and knees. Not restrictive. With these pads, you get protection without movement restriction. Keeps your knees warm and limber. You’ll be ready to jump off the bench and play when your team needs you the most. These leg sleeves are a bit pricey, but if you are serious about basketball the investment is well worth it. Knee conditions are very painful. But if you buy the right knee brace, you can start feeling better in a hurry– all without having to swallow down potentially harmful pain relief medication. This stylish looking knee brace is designed to help people who are suffering from arthritis. Here are its main selling points. Ultimate comfort. This brace is made from breathable fabric– not smelly rubber. It’s the perfect brace to wear around the house. Effective knee compression. Compression is proven to help alleviate arthritis pain. No neoprene. If you dislike the smell and feel of neoprene, this is the brace for you. 100% satisfaction guarantee. If your brace doesn’t fit or if you’re unsatisfied in any way, Kunto will give you a full refund. This is the perfect brace to wear to bed or around the house. It’s very comfortable and not itchy at all. On the other hand, it does slide around a bit when you walk or move around. People suffering from meniscus injuries need extra knee support. This brace is well designed, yet it’s also quite cheap compared to competing knee braces. Designed for injury recovery. This brace will keep your leg stable as your body heals. Easy to put on and remove. Strapping on this brace and taking it off is a quick, easy and painless process. Slim and compact. This brace is slim enough to wear under pants. Fully adjustable. Adjust the velcro straps until you get the perfect fit. 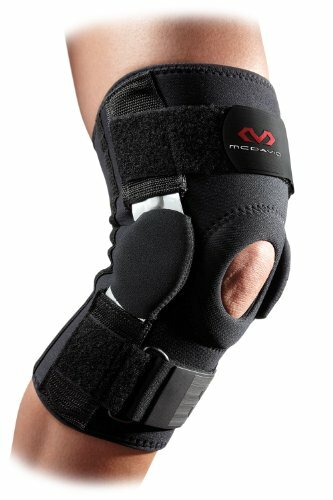 This knee brace is great for recovering from injuries or surgeries. It’s probably too restrictive for people with minor knee injuries, though. The 6446 Leg Sleeve by McDavid has an innovative “web” design that sets it apart from the pack. Designed by an ACL specialist. ACL specialist Dr. William Nordt came up with the patented design. Dynamic webbing. This brace’s unique lightweight design allows for a nearly complete range of motion. Used by professional athletes. The United States olympic snowboarding and ski teams use this brace. Lightweight and breathable. Fans of this brace say that they sometimes forget they are wearing knee protection when they have it on. This brace/sleeve hybrid is perfect for athletes recovering from an ACL injuries. It’s flexible, yet incredibly stable. The only downside is the expensive price tag. Still haven’t found what you’re looking for? Here are a few other types of knee support accessories to check out. 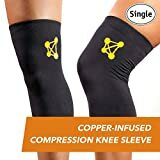 Even though studies haven’t yet proven that copper speeds up knee injury recovery times, some people swear that copper knee sleeves really work. The Recovery Sleeve by Copper Compression is one of the most popular copper knee sleeves out there now, so it’s a good place to start if you’re curious about this new type of knee sleeve. 88% copper. The inside lining of the knee brace is made from real copper. Stimulates blood flow. The copper lining is designed to aid blood circulation. Fights inflammation. Inflammation causes joints to swell, making existing injuries even worse. Doesn’t restrict motion. This sleeve won’t change the way you play when you wear it. If you want to try out a copper knee sleeve, check this one out first. 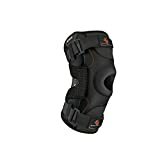 Hinged knee braces are ideal for people suffering from serious knee injuries. The Ultra Knee Supporter by Shock Doctor is one of the best ones on the market right now because it’s not as heavy as most hinged knee braces. Super stable. The knee hinge insures that your knee won’t twist or turn in the wrong direction. Easy to put on and take off. Finger tabs allow for easy removal. Unique “X fit” strap system. The X strap system is comfortable and easy to adjust. Moisture wicking. This brace is made from neoprene, so it’s easy to wash and it won’t get sweaty. If you’re in the initial stages of recovering from a serious knee injury, you need a hinged knee brace. Unlike most hinged braces, this one from Shock Doctor is slim and lightweight. 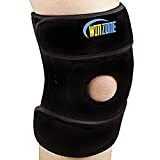 One of the best neoprene knee protectors out there now is the Knee Support knee sleeve by WinZone. Let’s take a look at what it has to offer. The #1 bestseller on Amazon. This neoprene knee sleeve is cheap and effective, which is why it recently made to the number one spot on Amazon. Versatile. It’s not fancy, but it doesn’t need to be. This sleeve is a great all-around general purpose knee support accessory. Easy to clean. Just throw this knee sleeve in the laundry with your other clothes when it’s time to wash it. Durable. Neoprene is tough and maintains its shape over time. If all you need is a basic neoprene knee sleeve, Knee Support by WinZone is the product for you. 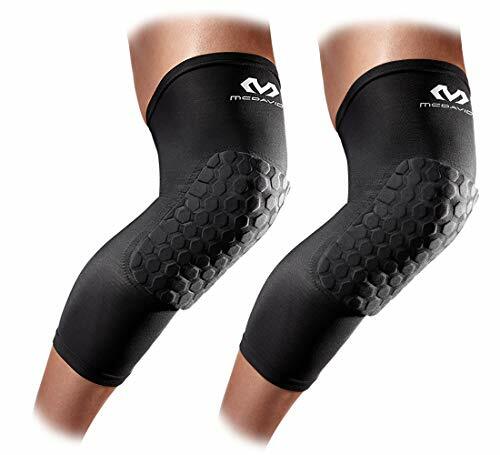 It’s good for basic knee protection, but people who are suffering from knee pain will want a sleeve that offers more effective compression.